A day to escape everyday life and celebrate summer! When you take time to be still, eat well, move your body and create opportunities for a healthy, happy life, well, that is true bliss. And you shouldn’t wait a lifetime to find this elusive bliss. But unfortunately life can sweep you away from yourself. You always feel that there isn’t enough time, and you’re so unbelievably busy. Busy-ness is a painful epidemic sweeping over the world, leading us farther and farther away from ourselves. All kinds of self-care practices go out the window especially if you aren’t being mindful and aware of what is happening. And when you’re not taking care of yourself, you aren’t truly tuning into your body, mind and soul. So it’s time to take a break. A BIG break. Just for ONE day. Connect to your deep self again. Immerse yourself in adventure, awesome food and community. Make time for yourself, to recharge in an atmosphere that supports your well-being. If you desire a chance to immerse yourself in nature, all while reaping the benefits listed above, then join us for SUMMER WELLNESS ESCAPE. 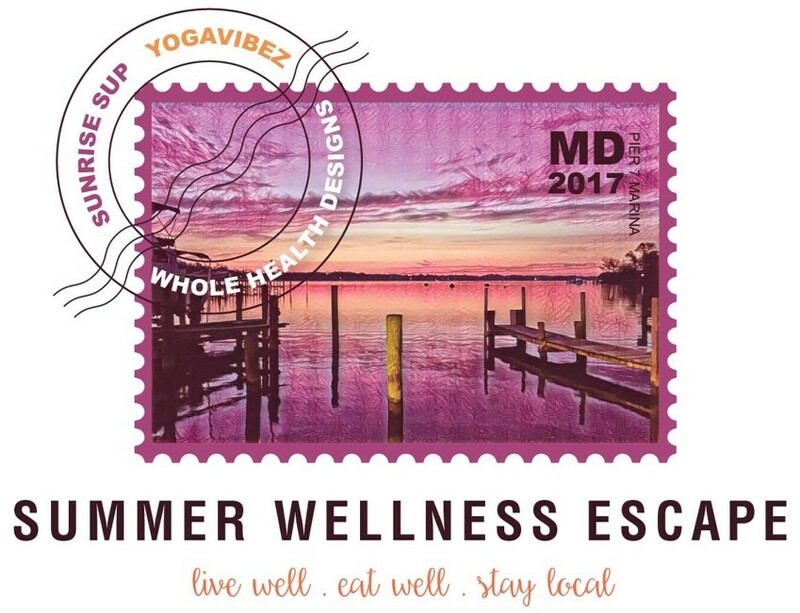 Join holistic health consultant, author, and founder of Whole Health Designs, Lisa Consiglio Ryan, and Sunrise SUP and Yogavibez founder and yoga and SUP instructor, Kate Grove, for a life changing experience filled with yoga, SUP, meditation, and freshly prepared meals all designed to enhance your personal health and well-being. The Summer Wellness Escape will have the perfect mix of connection, simplicity as well as rolling -wave- sand- in- your- toes water time, offering you the most unique experience. There are retreats and then there are ESCAPES. There is a big difference. For one day, we will escape our everyday life! Summer Wellness Escape is unique! 1. No hotel food or tour buses here. 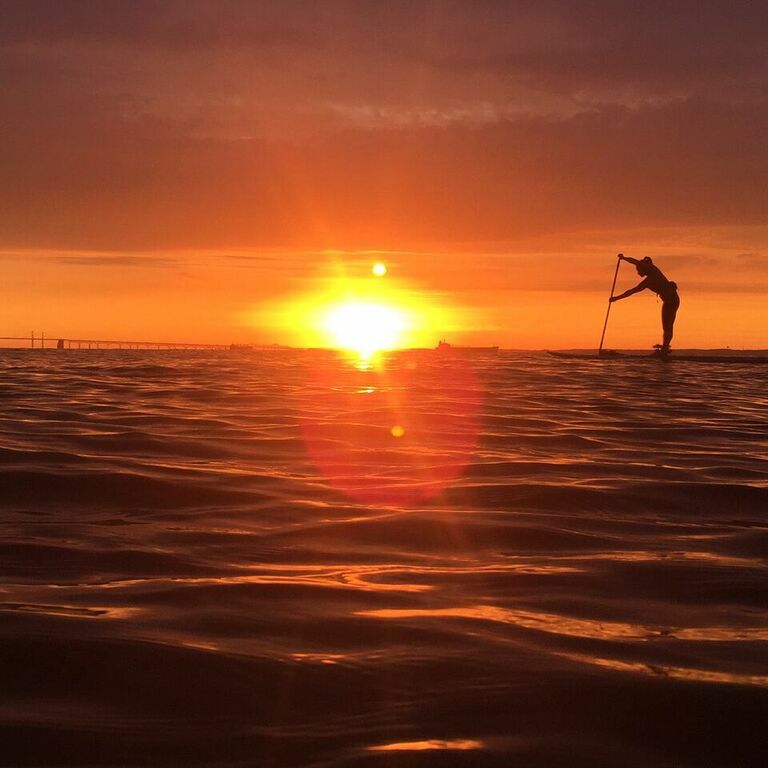 You’ll be able to walk to the water with juice in hand and do your Sun Salutations in the sand as well as on your SUP board. 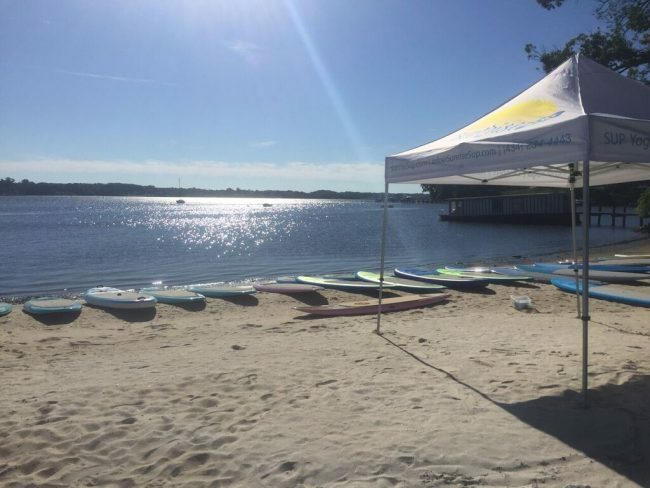 Yogavibez yoga studio is right on the water with a gorgeous view. We will have an itinerary for you but we build in time for you to explore, rest and even take a cat nap. Ahhh, feels good, doesn’t it? 2. During most trips you eat a lot, drink a lot, don’t really sleep and exercise because you are scheduled for every hour, every day to hit the attractions. You come home tired. Heavier. Regretting the fourth margarita and “just one more dessert” on your last day. You feel like you need a vacation from your vacation. Not gonna happen with Summer Wellness Escape! 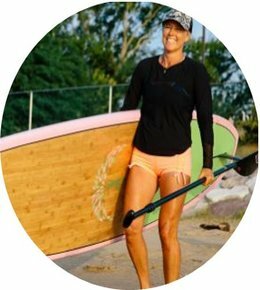 You’ll be eating healthy meals, drinking healthy drinks, relaxing, resting, unplugging, as well as moving your body with yoga, SUP, sailing, etc… You’ll come home with high energy, lightness, ready to take on the world! Plus you’ll learn all kinds of techniques to keep the glow going for a long time after. 3. You don’t have to do ANYTHING! Really. As soon as you arrive we will be waiting for you with a healthy treat. We’ll have all your meals prepared for you. All activities will be planned for you. No ordering take out. No waiting in line to rent boards or mats. No pressure. No planning on your part. No stress. We are taking care of it all. Escape! Summer Wellness Escape will offer you life-enhancing rejuvenation that will introduce you to a new way of living, moving and eating, as well as skills that will create positive change in your life going forward. This escape is a unique blend of yoga, nutritional education, meditation, delicious organic and locally grown food, juicing, beautiful waters, creative arts and crafts (malas! ), reading, dreaming, interesting and enlightening conversation. And most of all, an opportunity to hang out with like-minded people, take some time to breathe, relax and have a good time. All SUP equipment for activities (no need to buy anything!). Catamaran cruise on the water! We will have dinner on the boat as the sun sets. Surprises + Goodies (think LuluLemon!, raw chocolate, etc…). BONUS: Raw Renewal 7 Day Detox program so you can keep the glow going after your escape! Summer Wellness Escape is a luxury trip with a laid-back vibe. Kate and Lisa will take amazing care of you. All of your activities, meals and fun are waiting for you! This is NOT a trip with hotel food and tour buses. Heck no! 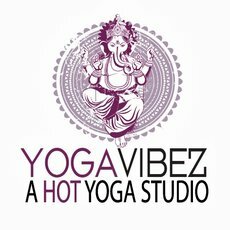 You won’t need to do anything but come willing and ready to relax and be taken good care of once you arrive at Yogavibez. Meals are plant-based and healthy. We can accommodate those with allergies as well as gluten-free. We will provide juices for morning and afternoon snacks, smoothies made of fresh seasonal fruit, etc… lots of nourishing delicious food to keep you well-fed. Whole Health Designs does a remarkable job of using produce grown locally, organic, as well as delicious. 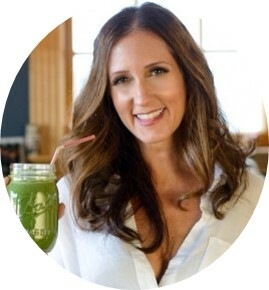 Lisa will be leading fun interactive talks/demonstrations throughout the day that will cover food and healing, meal preparation and planning, forming healthy habits, self-care practices, detoxing, juicing, mindful eating and more. The health and nutrition education will be experienced first hand within the amazing surrounding environment, during circle time, meditation and our group as we site down to dine together. Expand your Yoga practice in the serenity of a quiet outdoor setting. 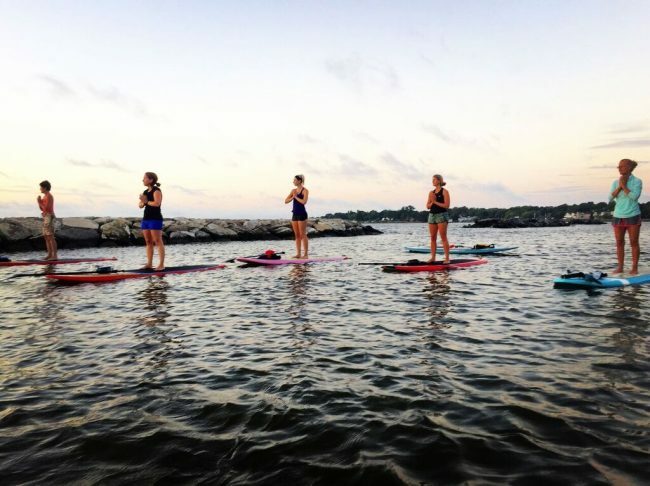 SUP is a great way to connect with nature while amplifying the physical and mental benefits of yoga movement. 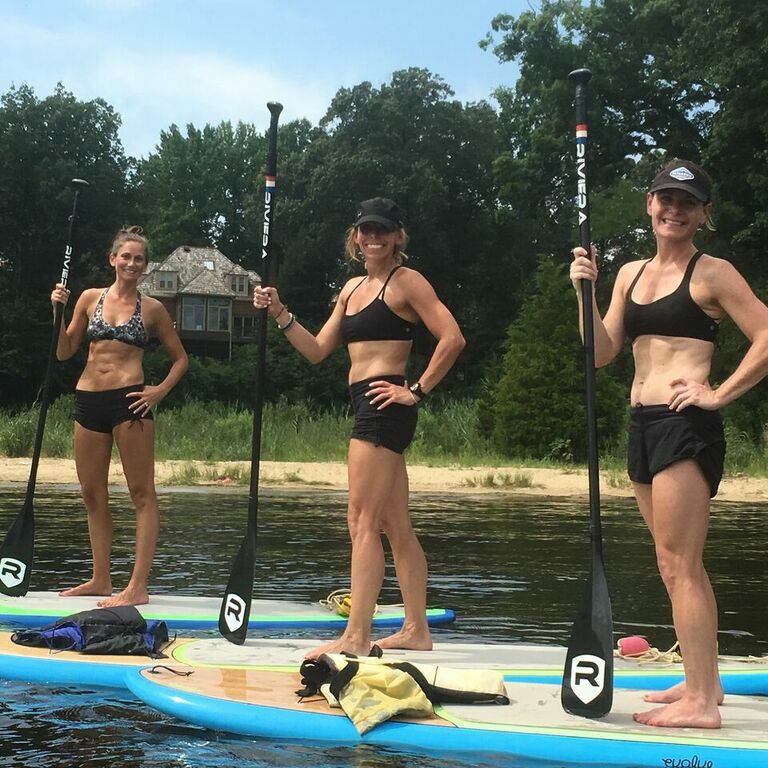 We will cover the basics of SUP to ensure you are comfortable on the water. 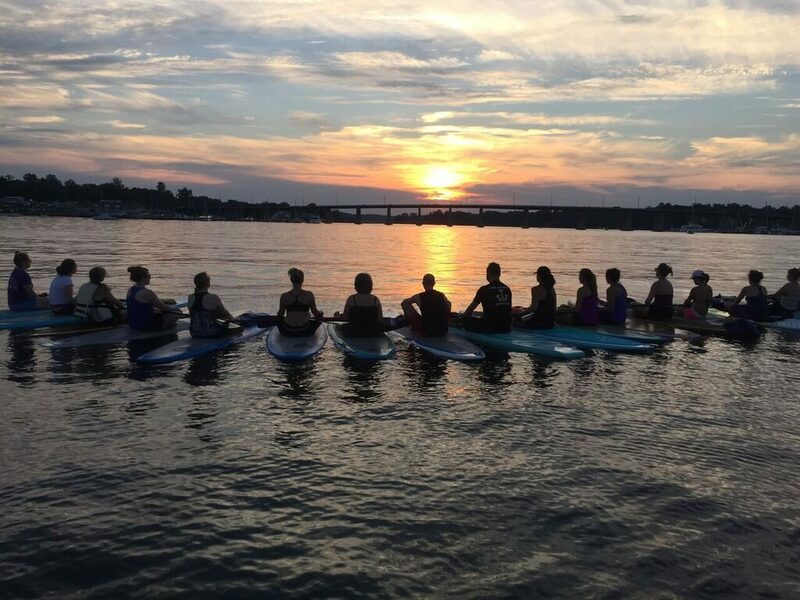 The group will paddle to calm waters, anchor your board and perform a yoga flow designed to maximize your connection with the outdoors. Lead by Kate Grove, Yogavibez co-owner and Sunrise UP founder, you will experience the healing art of Restorative Yoga, the practice of kindness and self-compassion. This practice may just be the secret to feeling your best ~ rejuvenation, relaxation and pure bliss. Lisa, who is certified in Shamatha meditation technique and Shambala trained, will lead you through a guided meditation, exploring your senses, connecting to your body with mindfulness practices as well as being still with your truth. We will make mala bead bracelets so you can take your practice home with you. 12:30 – 2 pm: Lunch on the beach. Connection, community and sisterhood. Discussion on how to eat for summer, raw foods, juicing and cleansing. 2 pm – 3 pm: Guided meditation and yoga class. Bonus! *craft- making mala beads! 6 – 8:00 pm–Dinner on the catamaran! Sailing, celebration and fun on the water watching the sunset! Wrap up closing circle, goodbyes and good wishes, hugs and thank you’s PLUS a goodie bag to take home. All meals and activities are included in your Total Wellness Escape package. 7 day class pass for yoga and fitness classes. Continue your wellness journey with a raw food menu plan, recipes, shopping list, journal, and more! You’re in! You’ll receive a welcome letter with specific information about the Summer Wellness Escape. No refunds after May 31st. You can transfer your spot to a friend as we won’t be able to offer a refund at this time. Great grad, birthday or beginning of summer gifts! Q: Is there a rain date? Yes! June 25th. To be honest, the weather will be perfect! We are manifesting a gorgeous day! But for some reason if it is storming, we will plan for June 25th. A lot of the times it might sprinkle a bit in the morning but usually Annapolis is graced with sunny skies in summer. Kate is the BOSS when it comes to watching the weather so we will keep you posted all week long with weather updates. Q: What does my retreat include? There’s so much included where do we begin. SUP (board included), yoga classes (all yoga equipment and accessories included), guided meditation, two delicious vegetarian meals a day complete with fresh juices, smoothies and detoxifying snacks, and an Instagram-worthy time sure to make everyone back home jealous. Plus a goodie bag full of wellness prezzies! Q: Can I bring a friend or two with me? Sure thing! We encourage it! Q: What happens if I can’t come or change my mind? You will receive a refund less the non-refundable deposit IF done before May 31st. 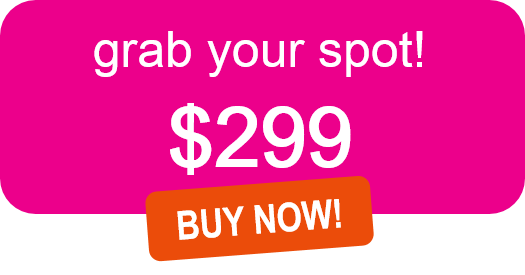 After May 31st you can transfer your spot to a friend or loved one, but we will not be able to offer a refund. Q: What will I be eating? I have allergies and food restrictions. Plant-based. Local. Healthy meals. We are focusing on clean, anti-inflammatory, seasonal foods: lots of fresh fruit, smoothies, gluten-free and organic as often as possible. 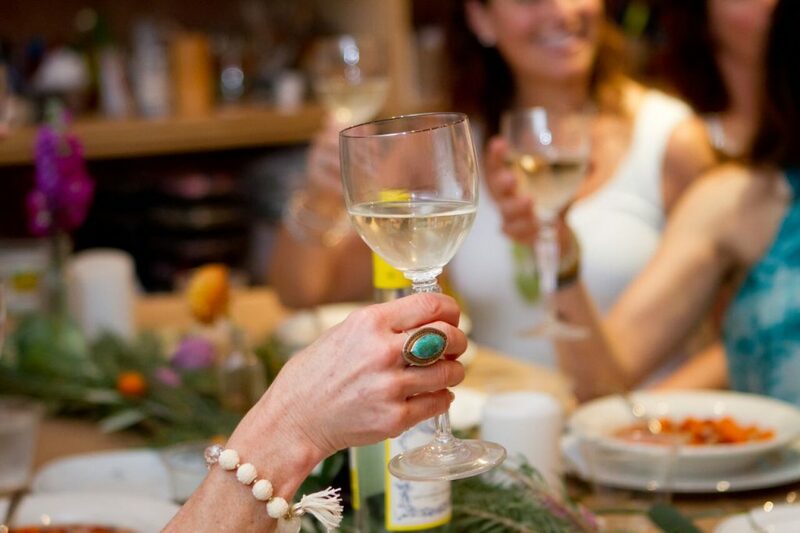 Food allergies and gluten-free diets can be accommodated. Lots of nourishing delicious food to keep you well-fed. Meals will be prepared by Lisa and the Whole Health Designs staff. Q: Is this a trip only for the “athletic type?” No. This is a trip for the “I care about my health and well being type.” There will be a lot of opportunities to do yoga, SUP, etc, the activities fit every activity level. We are so thrilled about all the fun we have in store for you. The best part is that you get time away, to be still, to really connect to that gorgeous body of yours. You’ll feel lighter, energized and glow from head to toe, inside and out. You’ll create memories that will last a lifetime! We’d love to share this amazing experience with you. We can wait to see you at Summer Wellness Escape!